At a Café CSE sponsored by the David M. Kennedy Center and the Center for the Study of Europe, John R. Rosenberg and A. LeGrand Richards came together with Martha Peacock to discuss the history of the European university and its liberal arts foundation. PROVO, Utah (December 3, 2014)—Where did the concept of the modern university originate? John Henry Newman, an Oxford scholar and, later, a Catholic cardinal, lectured on the role of the university – He framed the discussion of a middle ground between free thinking and moral authority or, in other words, between knowledge and revelation. At a Café CSE event sponsored by the David M. Kennedy Center for International Studies and the Center for the Study of Europe, faculty from fine arts, education and humanities discussed the European university and how its medieval institutions have influenced the modern university. Martha Peacock, professor of art history, moderated the discussion between John R. Rosenberg, dean of the College of Humanities, and A. LeGrand Richards, a professor of education leadership. Rosenberg said that the modern university came out of Europe in the 12th century. 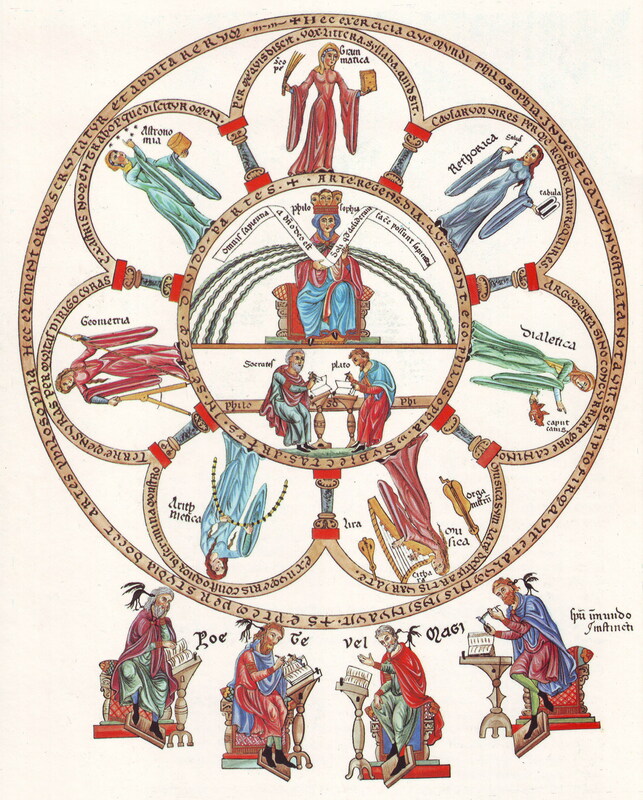 Plato and Aristotle’s notion of the seven liberal arts formed the basic system that was adapted in the medieval university as the foundational curriculum. In a visual representation, Plato and Aristotle sit in the middle of a circle, surrounded by two basic dimensions of study: one based on language and one based on numbers. These two dimensions are, respectively, the trivium ­— made up of grammar, rhetoric and logic — and the quadrivium — made up of arithmetic, geometry, music and astronomy. Often in the modern university, there is a divide between language arts and numbers as if they are two completely different domains of human experience; however, that was not the case in the medieval university. For example, in the medieval university, one who studied law studied rhetoric and moral philosophy. Medicine was the study of natural philosophy, or science, and logic. At the medieval university, there is a conversation in which all of these aspects of knowledge are brought together in what has been called “the great conversation of mankind: the human conversation,” said Rosenberg. Richards talked about the evolution of the European university. He explained that Humbolt used the phrase “general education” not to describe a broad range of education but an education where everyone has the opportunity to receive a basic schooling. As most European universities are free or relatively cheap, this idea seems to remain today. Rosenberg mentioned the general support of college administration and research done by the college showing the widespread reach of a liberal arts education. To hear the discussion in its entirety, watch the video on the Kennedy Center’s website.